In October, I got a phone call from a friend Melanie Henderson who had been contacted by Davie Gardiner (a music & all things Shetland promoter). 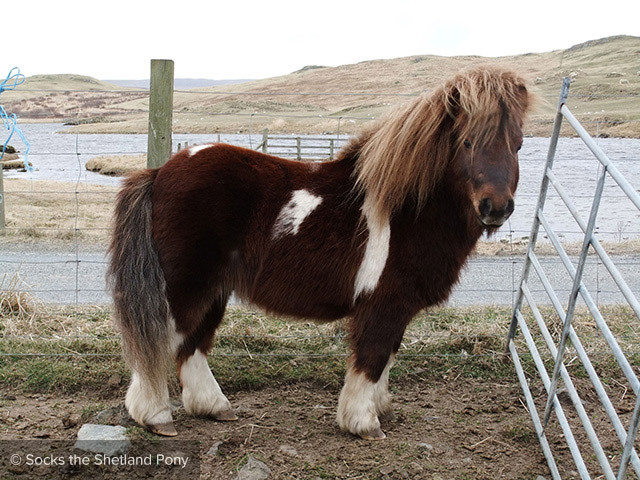 Davie was looking for contact details of Shetland Pony Studs who would be willing to show a couple of gentlemen from south their ponies. My initial reaction was that I wouldn't have the time but I'm glad that when Davie phoned a couple of days later that I had a morning free. Not really understanding what they were looking for they saw the ponies. One of the gentlemen took interest in Socks so photos & movement videos were taken of him. The other pony they happened to like was Socks' daughter. After a morning of ponies, I said goodbye to the charming men. Well, that morning was the beginning of an incredible journey. Davie was their tour guide & I got phone calls updating me on the selection process on an almost daily basis - Socks was still in the running! After a few trips back to see Socks, more photos & more movement videos, Socks was confirmed as the selectors choice as the 'star'. I must admit, I was still a little confused as to what it was all about. Once I'd had a proper discussion with one of the well mannered gentlemen from south that I became aware of what was being asked. Of all the things to do, I searched Google for the 2 gentlemen. Both worked for a production company based in London called Blink. The company have won numerous awards - well impressed. When it came to finding out about the 2 men, well I was astonished. Ewen Brown & Dougal Wilson, renowned Producer & Director respectively. Unfortunately, due to work & personal commitments I couldn't carry out Socks' training & handling during the 2 weeks prior to 5 days of filming. I was delighted when they suggested Elaine Tait from Burra to undertake the mammoth task. Elaine's father & mother, George & Barbara Tait, own the Merkisayre Stud. I've admired Elaine's handling of ponies in the show ring so knew her & Socks would get on well, even with his little quirks!! Elaine has done us proud. Expertly, calmly & coolly she & Socks produced the goods. The weather was very changeable & challenging. It certainly didn't help Bjorn Roar Larsen who was Socks' stylist during the filming. Socks needed hair extensions fitted to his mane to give him a fuller look. 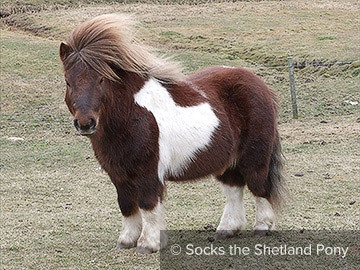 Bjorn & Marie Sharp of Sharp Image in Scalloway spent many hours bleaching & dying the extensions to as near to Socks' natural colour as possible. Not forgetting the blow drying in the horsebox between shoots. Socks' untamed mane & tail was a task not to be undertaken lightly. I was over the moon when they asked Hughie to be in the advert too. Hughie had been missing Socks so badly. Their scene is the stone wall one (Hughie behind the wall & Socks moonwalking past him). After the filming was over, Socks & Hughie had a brief reunion which was lovely to witness. It's a shame we couldn't have let them off their leads & let them caper for a while but that would've ruined the hair extensions. The ponies in the background of the advert are a mixture of George & Barbara Tait's stunning Merkisayre Stud ponies & my miniature stud ponies. My piebald stallion Merrylees Nuggett was the only pony at home - poor peerie man got left out! I was lucky enough to be present for some of the filming. What a talented & professional group of people they were. I was honoured to have been part of it & to be there for the final scene at the Eshaness Lighthouse was incredible.